MANILA, Philippines - Malacañang Palace through Proclamation Nos. 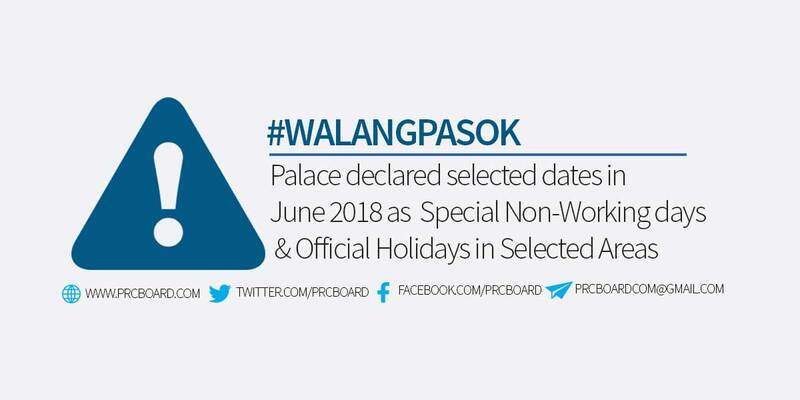 494 to 505 series of 2018 declared June 6,9,11,16,18,21, 2018 as special non-working days at selected areas and June 12 & 15, 2018 as official nationwide holidays due to celebrations of various important events. Special non-working holidays and official holidays are specifically declared on the following dates for the celebration of respective occasions. Proclamation No. 505 - Special non-working day in the Municipality of Rosario, Province of Agusan del Sur on June 21, 2018 (Thursday) for the celebration of Yagi-Yagi Festival of Native Cultural Heritage. The above-itemized proclamations are courtesy of gov.ph Official Gazette. For further updates, we advise our visitors to bookmark this page or follow us at our social media pages via Facebook and Twitter.